The Linear Bold Hybrid Display System is the newest addition to the Linear line up! 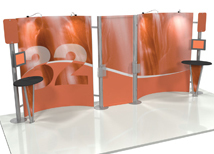 This series of Linear displays offer unique styles and accessories to create a custom display at an affordable price. The Linear Bold display has a lifetime warranty and is designed to last through the abuse of multiple shows. Although the Linear Bold looks like a custom display, it is actually very easy to assemble and is very modular. This line of displays can be customized however you like. Free 3D renderings are available for every custom job and there are no custom charges for customizing a standard kit! 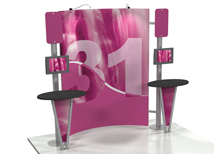 Please make sure to check out our entire line of custom modular displays! 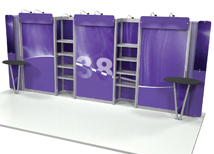 Linear Bold displays hit the US trade show display market a few years ago and are becoming increasingly popular because of the unique style and quality materials. Linear Bold displays are built by Orbus Company and Origin Exhibits which are two highly regarded companies that are know for producing very high quality products at affordable prices, with custom design capabilities. Northwest Creative Imaging carries every line of Orbus and Linear products at close to manufacturer direct prices. We can accomplish this because we run a sustainable business that is lean and focused on one goal. This allows us to reduce overhead and pass along the savings to you. All of our Linear Bold displays are priced to compete with lower quality substitutes that do not compare in quality. We do this so that our customers are not forced to purchase a lower quality display because of a limited budget. 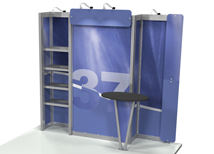 Please check out many of our other great values including Hop Up displays, Waveline displays, and Coyote pop up displays!